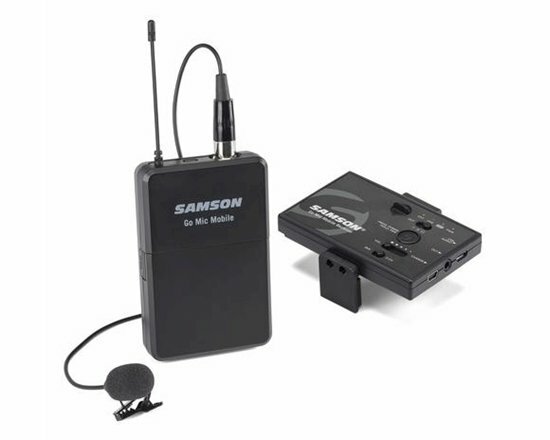 Designed for mobile filmmakers, the Samson Go Mic Mobile System provides both a dual-channel receiver and a transmitter in the form of an LM8 lavalier and belt pack transmitter. The receiver, which is dual-channel, can mount directly to your smartphone or DSLR camera, and allow you to transmit 48 kHz audio directly to the destination of your choosing. The receiver itself plugs directly into iOS devices with the included micro-USB to Lightning cable, though it can also communicate with other devices utilizing either micro-USB or USB-C cables. Once the transmitter and receiver are paired, low-latency audio streams from one to the other without sync issues. The system works at distances of up to 100’ line of sight, operating on the 2.4 GHz frequency band, and giving you a frequency response of 10 Hz to 22 kHz for high-quality audio capture. With the LM8 lavalier and included belt pack transmitter, you'll have a discreet, low-profile microphone, as well as freedom of movement. The system’s rechargeable lithium-ion battery can last up to 12 hours, doing so without draining the battery of your smartphone. Included in the Go Mic Mobile are a 3.5mm headphone/line-out cable for monitoring, as well as a shoe mount adapter. Note: The Samson Go Mic Mobile offers digital audio compatibility with Android devices running Android 5.0 (Lollipop) or later that allow USB digital audio connectivity. Not all Android applications support USB audio, and you may need to download a third-party app to use this feature. Analog connectivity via the included 1/8" (3.5mm) cable is offered as an alternative solution.